My daughter wants to be a spy. Specifically, these days, a CIA operative. What does this have to do with food, you might wonder? As we’ve been working our way through the library holdings of spy books for children, I re-found of course, Harriet the Spy, which is one of the best books for children that’s ever been written. Harriet is wedded to routine, including her spy route, Ole Golly, her coveted notebooks, and a snack of cake and milk every day after school. If I grew up eating cookies and milk after school, why couldn’t my kids have a very small slice of homemade cake and milk? 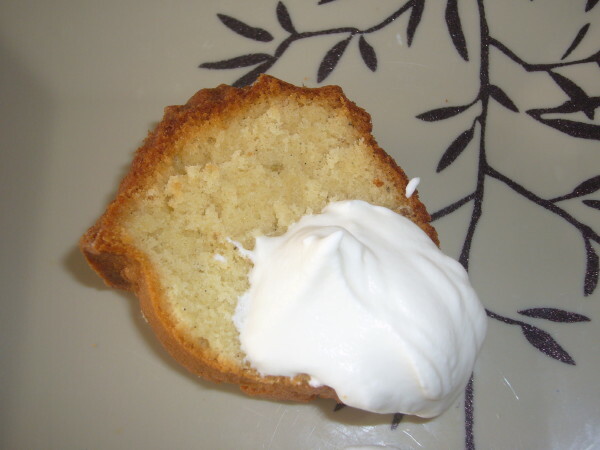 I decided that what was good for the goose was good for the goslings, and we started our own Harriet the Spy ritual: cake + milk every day after school. Seriously. This was a big hit with the offspring, of course, solved the problems of all those leftovers, and even made homework a lot more pleasant on tired days. To keep the cakes fresh, I cut them into very thin slices, wrapped them in Gladwrap (that spaceage weird plastic that sticks to everything. It’s not green, but used sparingly in your home it is perfect for jobs like this), and froze the whole batch in a gallon ziplock freezer bag. 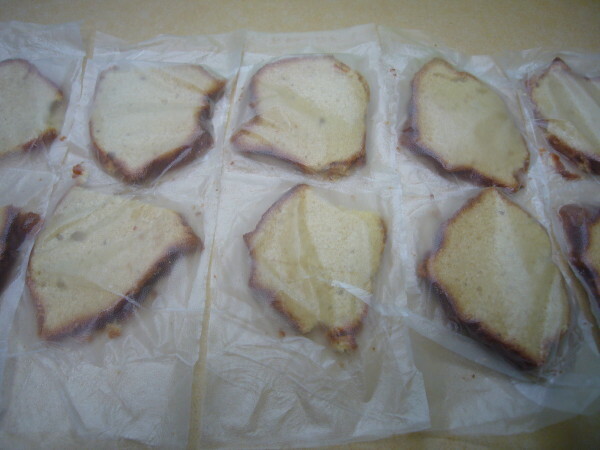 Now, each day, I can take out 2 small slices, which defrost very quickly. 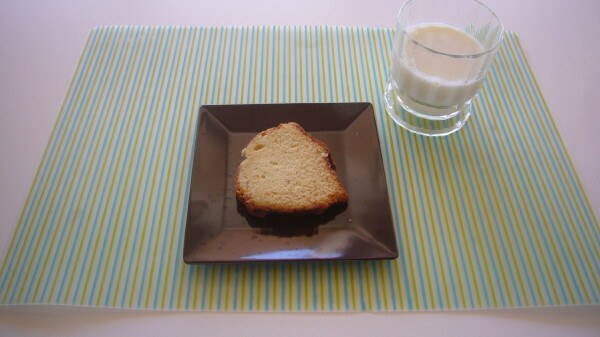 It gives me unreasonable pleasure to set out the cake on two small plates with two small glasses of milk. This is an amazingly economical strategy, too–absolutely the recessionista way to give your kids fun snacks. Recently, when we ran out of our chocolate cakes, I baked a cardamom vanilla pound cake, which was pretty enormous, and delicious. We had two family desserts from it (above, with whipped cream), and still enough leftovers for 2-3 weeks of afterschool snacks. (Remember, very small slices of something really good is very satisfying. Plus you don’t want to ruin dinner.) Even though the cardamom and vanilla is expensive, at this rate, I figure I can bake about once a month, and have a real treat in the house. The side benefit is that when they beg for dessert you can remind them they already had it. 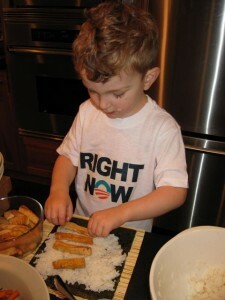 In the spirit of the day, we took a vote on our celebratory Inauguration Day dinner, and sushi won. 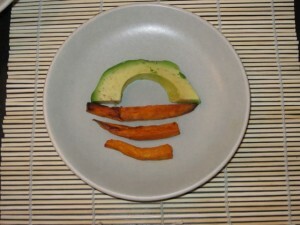 It’s one of those modular meals that everybody likes because each can tailor it to his or her own taste. Of course in this house, it’s all vegetarian sushi; all I can tell you about the fish is go to the best fish market you can, ask them what’s freshest, and have them cut it for you. 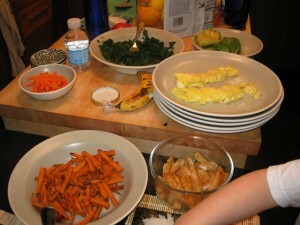 The main thing is to make the rice (recipe below) and then slice up and lay out whatever filings you like. It’s not fancy here — cooking with kids is always a bit of an art project — but it’s always tasty. cucumber, shitake mushrooms, and any kind of pickled vegetables are also nice if you happen to have them. To make the rice, first cook 2 cups short grain rice in 3 cups of water. While it’s cooking, combine in a small bowl 6 T rice vinegar, 2 1/2 T sugar, and a pinch of salt. Let the rice cool a bit after it’s cooked, just by spreading it out in a large bowl, then stir in the vinegar mixture. Keep the rice covered with a damp cloth to keep it from drying out while you’re making the sushi (we never have this problem). It’s helpful (but not essential) to have a bamboo rolling mat; a small kitchen towel will do in a pinch. Lay your sheet of seaweed on the rolling mat or towel. 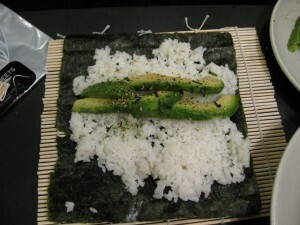 Spread the rice on a sheet of seaweed, leaving a slight border at top and bottom but getting it all the way out to each side. 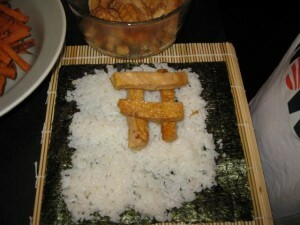 Lay your fillings on top of the rice in a small pile. 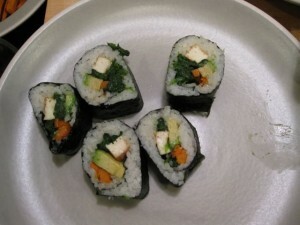 Roll the seaweed up over the filling, and then continue rolling into a tight cylinder. Slice and eat! 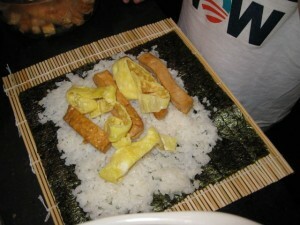 Eli likes to make train tracks with his tofu slices; we admire, and then rearrange. This recipe is easily one of my favorite recipes for spaghetti. It’s quick, simple, and can be made with what you likely have in your pantry on any given day of the year. The blend of garlic, anchovies, a good olive oil, and tomato paste creates a rich, garlicky, slightly nutty sauce that slicks the pasta in exactly the right way. The kids adore it, and you can use it as good, meatless main course any night of the week, no matter how little time you have, or it can be served in small portions as a first course for a dinner party or for more formal family dinner (if you are so lucky as to have those in your house). I believe I found the original recipe in a magazine many years ago, but it’s been tampered with to suit our family’s preferences. You should tamper, too. First, mince 1-3 cloves of garlic, depending on your taste, and sautee them in a generous 1/4 cup of olive oil over medium high heat with 2-4 anchovies . If you really hate anchovies, don’t give up on this recipe. They add depth and richness to the sauce. Rather than leave them out, just add one or two. But be sure to use the good ones, packaged in a glass jar, not a tin. The price is worth it. When the anchovies have dissolved and the garlic is slightly golden, add a small can of tomato paste. Stir to bind up the garlic in the tomato paste (if you don’t it will burn as the sauce cooks), add a bit of salt and a good sprinkling of whatever herb you like or have on hand. We use a lot of fresh, dried oregano, because we have a terrific bush in our backyard. But I’ve used fresh dried rosemary, or fresh basil, parsley–whatever mix or blend or solitary herb you like. Turn the heat to low, and let the sauce cook, and cook, and cook, for about twenty minutes or so, until the raw paste has cooked through and the whole thing turns into a lovely, pasty mess. There will be some separation of oil and tomato, and the oil will take on a lovely reddish, orange hue. This is good (to eat, but not on your clothes). If it looks too dry, you can add oil along the way. Toss this sauce over your cooked pasta. This recipe will make enough to dress 1 lb of pasta, but it actually freezes well if you want to use just part of the recipe. I’m a big believer in the right pasta for the sauce, so I wouldn’t use anything other than a good spaghetti for this recipe. Also: don’t use too much. The sauce should just bind, not soak, the spaghetti. Confession: I’m a little crazy when it comes to cooking, even on weeknights, and sometimes I do things that are more involved than I have time for. But I also like to keep things around that are delicious, and which I can just pull from the refrigerator on a moments notice, which can turn a meal from a run of the mill affair to something seasonal and inviting. Because we depend on farmers and seasonal produce, simple things can be special because we don’t eat everything all year round. Ella and Finn know when it’s apple season, or crab season, and that when holidays and parties roll around, they get pate. One of the things I love to keep around during the week is roasted peppers, another is fegatini (which I’ll write about soon), and another is steamed artichokes. For most of the country, artichokes in January are just not available unless they come from far away, but some showed up recently in our market, including really ugly, blemished ones that are called “frost-kissed.” I think they’re not quite as good as the ones we’ll get later in the spring, but the inner leaves are tender and sweet and the hearts are excellent. I have a large, three-tired steamer, which is bulky but very, very handy. I trimmed the stems and peeled off the bitter outer leaves, then threw the artichokes in the bottom tier and steamed until they were tender–about an hour for the large ones, 30 minutes for the mini-sized. I mixed up a batch of faux aioli, which is another Thing That Keeps, at least for a couple of days, and which we also use on crabcakes. While the artichokes take some time on day 1, I had several left over, which I tossed in the refrigerator, and was able to bring out another day. Instant vegetable. So, my point is not so much about artichokes, or peppers, exactly but about planning. My roast chicken, for instance, with the help of Trader Joe’s excellent-in-a-pinch premade pie crust, makes a speedy and delicious chicken pot pie. I very often will roast several bunches of beets on market day, dress them simply in olive oil, then have them all week. We can add vinegar, arugula, goat cheese. Etc. What kinds of things do you prep ahead and keep for those days when you need a quick snack or on those nights when you need something fast to round out your table, when the kids have had enough of their Webkinz, or soccer ran too late, and they’re clamoring for, you know, something to actually sustain them? In a mortar and pestle, grind 1-2 cloves of garlic (to your taste) with coarse salt (sea, kosher, hawaiian red…). Add the juice of about 1/2 a lemon or meyer lemon, continue grinding until you have a thin, smooth paste. Add maybe 1/2 -3/4 cup mayonnaise, mix to blend. Taste, correct seasonings. Catherine Newman understands how it goes with kids and vegetables, which is to say she understands how it goes with kids and [fill in the blank] — you cannot ever predict. I’m guessing that her son’s eventual, somewhat grudging acceptance of kale did not mean an end to kale refusal, but was just a moment that she could cling to on days when nothing–with food nor anything else–was going right. He tried the kale. Whatever else happened, he’d at least tried the kale. In our house, it goes something like this: I put the spinach on the table. It’s sauteed with olive oil and garlic, it’s got a good squeeze of lemon juice on top, and maybe even a sprinkling of pine nuts. Three year-old Eli looks at it and says, “Spinach! 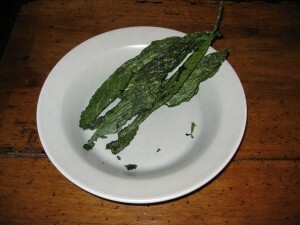 Yum!” Then he takes a bite and puts down his fork, shaking his head mournfully, “I’m done with spinach.” The next night, I try again, this time with chard, and he shouts “I’m back in chard corner! I ate five serves of chard!” Six year-old Ben, meanwhile, sometimes gobbles it all up easily, sometimes discerns a drizzle too much olive oil and rejects it outright. All you can do is keep putting the vegetables on the table, but I have learned also, whatever else I am serving, to put down a bowl of carrot sticks. Whatever else might happen, they’ll always eat the carrots, and I can offer myself small comfort at night that at least they won’t die of scurvy. I tried something new tonight, and they eyed it with great suspicion. They picked it up from the very edges and just barely let it graze their lips before setting it down, not on their plates, but on the table (a sign of true rejection). I don’t understand it, when basically I was offering them kale potato chips. But also I do understand. Potato chips are familiar; kale is familiar; kale chips are New and thus we are starting the clock on these. But I will persist. The pages will fly off the calendar and perhaps one day the bluebirds will come to me, too. Wash, dry and trim the kale: Peel off the tough stems by folding the kale leaves in half like a book and stripping the stems off. Toss with extra virgin olive oil. Roast for about thirty minutes. The kale should still be bright green and will be paper thin and brittle. Remove from oven and sprinkle with sea salt. Transfer kale leaves to a cooling rack so that they stay crispy if you’re not planning to serve them right away.